A truly successful digital marketing campaign consists of three interacting parts; SEO, Paid Media, and Social Media. Each of these marketing tactics support each other. The research that goes into SEO and Paid Media campaigns determine what keywords should be the main focus of both efforts. Since it is impossible to organically rank in position one (or zero) for the hundreds of relevant keywords, paid media’s search engine marketing (SEM) campaigns can help to fill in the gaps. In order to keep Quality Scores high and CPCs low, SEM and SEO teams should work together to ensure that landings are as relevant as possible. In order to create a successful strategy, Paid Media planning includes competitor and keyword analysis. This data helps to determine which terms are popular in which areas, and which companies will need to be researched further. This competitor data helps social media determine which competitors’ social media accounts need to be audited and what topics are most relevant to the company’s target audience. Social Media uses this data to create engaging content that can then be promoted through paid media and used to create remarketing lists (read more on this topic here). 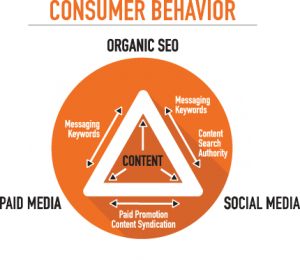 Social Media utilizes the keyword research from SEO to inform content creation and ensure that that content is in line with the overall marketing strategy. Creating engaging content that is shared and linked back to the advertiser’s website creates backlinks that then increase the site’s domain authority and boosts its organic SEO ranking. Utilizing all three marketing pillars decreases the cost of marketing by decreasing ad spend waste, identifying high-quality leads, increasing brand awareness, and engaging with target audiences organically. Paid Media fills in the gaps for keywords that can’t achieve top position through SEO and expands the reach of social media’s unicorn content. Social Media engages relevant audiences, creates remarketing lists, determines emerging trends, and promotes back linking through relevant content and social listening. An e-commerce company specializes in selling high-end espresso machines and gourmet coffee. Through marketing research, it is discovered that lattes are more popular in Ohio, while cappuccinos are the favored drink in New Jersey. “Espresso Maker” is the most popular term across the U.S. The SEO specialist works to increase page rank for the primary term of “Espresso Maker” as well as other key terms. This includes optimizing image tags, meta descriptions, and page content. The Paid Media specialist develops ad copy for a SEM campaign that includes the keywords, “latte machine”, “cappuccino maker”, etc. and places geo-targeted bid adjustments to focus the ads on the most relevant areas. She also works with the client to develop display ads, and Product Listing Ads. The Social Media Specialist develops engaging content around espresso recipes, coffee facts, and the various capabilities of an espresso maker; not to mention curated content concerning gourmet coffee pairings. When she identifies a particularly engaging piece of content, she alerts the Paid Media Specialist who then increases the content’s reach through paid promotion, all the while creating a remarketing list for search ads. The content proves so engaging that other sites link back to the content and the advertiser’s website. This increases the organic search ranking, not only for the website, but also for the advertiser’s social media accounts. When a potential customer searches for a high-end espresso maker he sees a shopping ad at the top of the page, followed by a search ad. Below that he sees image results that include product images from the advertiser’s website, the website’s organic result, as well as organic results for its Facebook page, Pinterest account, Twitter feed, and Instagram account. If you’re interested in seeing these types of results, contact Anvil Media and learn what our triangle can do for your business goals.